I'm really glad to find the complete version of this scan, it looks really beautiful. Ooooh, I much more like them in this manga version. But anyway Seba is cooler! Wahhhh! Kuroshitsuji II by Yana Toboso! ><! Awesome! Yeah, finally, an original by Yana Toboso! Yup, as I was suspecting, Alois is older than Ciel... or taller anyway. 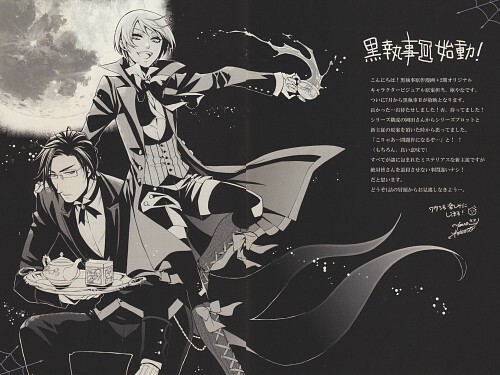 I know everyone still loves Sebastian, but I think Claude will do a fine job as the new demon butler. i hope to see this animation soon, nice picture, thanks! Woa the manga ver. look more better! but ciel and seba is much more cooler for me..
New season looks cool thus far - thank you for sharing :). love it^^ cant wait 4 the second season in a few days. I wait to watch kuroshitsuji2. Wonder what Toboso-sensei has planned up her sleeve...? Thank you so much. Kuroshitsuji 2 sugoii..